Around 10 months A. started fighting me on diaper changes. All my patience and loving words from Time for a Diaper Change didn’t prevent me from getting kicked on multiple occasions. It wasn’t until I had a huge bruise on my chest about the shape of her foot that I admitted something had to change. A. was able to stand by holding onto furniture by this time. She wasn’t very steady but had been pulling up on everything since 8 months. My Montessori training had said to transition to doing standing diaper changes once the child was able to stand. This embraced the child’s changing development and didn’t continue to put the child in an infantile state that they were physically past. By doing diaper changes while the child is standing the adult sends a strong psychological message that they are affirming the child’s new abilities. I understood Montessori infant/toddler centres did standing diaper changes. But I couldn’t figure out how to actually do a standing diaper change! I changed my diapering supplies to the bathroom itself in the little cupboard beside the toilet for easy access and put my changing mat on the floor in the bathroom. 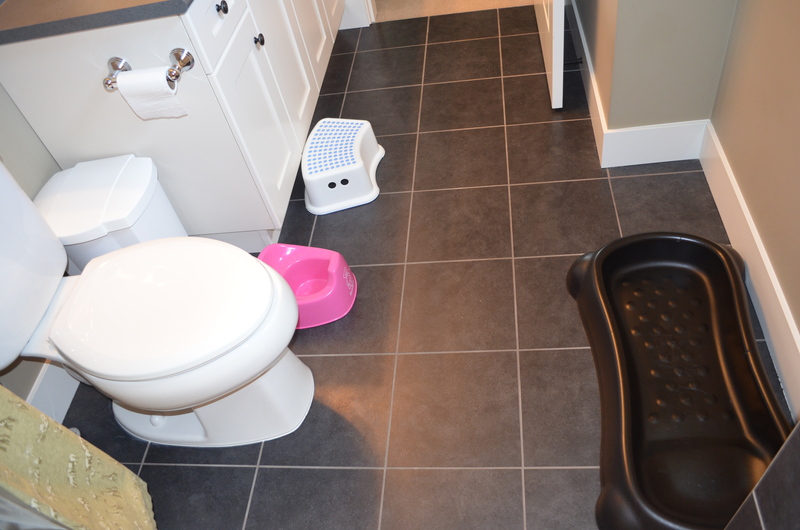 It was another step towards toilet learning by changing all things elimination to the bathroom. I figured that A. would need to hold onto something and the toilet seemed quite logical to me. I was all set to go! Day 1 – a complete fail! It was an awful day! I was ready to give up. That night I reflected upon A.’s reaction. She had been so much happier. And cooperative. So I turned to the internet for more advice. Daicia’s post1 and post2 completely restored my sanity and determination to give it a try for a second day. A huge thank you for these two posts! I was onto Day 2. Sitting behind A. so I could support her if she became unsteady and started to topple over (yes this happened many times), I took off her pants. Pants down, left leg out, right leg out. I would roll up her shirt or if she was wearing a onesie I would unsnap it and snap it over her shoulder. Undo the snaps (or velcro) of her diaper, keeping my arms wrapped around her for stability, and placed it to the side. If it was just a pee it was easy but poops were definitely more difficult. Wipe front to back, lift right leg, wipe, lift left leg, wipe, and another centre wipe for good measure. I wanted to ensure she was completely clean so I laid her down on the changing mat. She was never completely clean. Still to this day I lay her down for one last wipe. She doesn’t fight that last wipe (very cooperative actually) and I feel better knowing there won’t be any poop irritating her. I still don’t know how others do a fully standing diaper change for messy poops. Perhaps it’s easier when the child is steady on their feet and can bend over a bit more. Or when poops are solid logs and don’t get mashed in all the crevices. This solution has worked for us. She would sit on her potty as I dealt with her soiled diaper. Putting on her diaper wasn’t easy at first but didn’t take too long for me to figure out. Position the diaper on, do up the right side, do up the left side, and “fix” the diaper to ensure it was on properly. Keeping my arms around her for stability was key. She definitely gained a better awareness of the process of pulling pants up and down for diaper changes. No more fights. Increased awareness for A. of the toileting process. Diapering was completely moved to where toileting happens (the bathroom). We were one step closer to toilet learning.